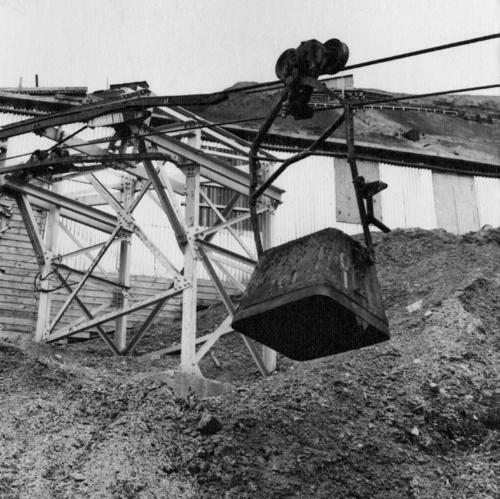 Photograph depicts bucket hanging from tramline in foreground. Support tower stands in midground in front of station building. Another building can be seen at top of mountain in background. Handwritten annotation on recto of photograph: "INCOMING BUCKET #1 STATION". Photograph was glued to cardboard backing with the annotation: "1962". Item is part of the Cassiar Asbestos Corporation Ltd. fonds. Image is one of six, see also items 2000.1.1.3.17.5 - 2000.1.1.3.17.9. Typed annotation on verso of photograph: "Fig 1", handwritten on recto: "2-3".